Louis Garneau showed up to Interbike in a big way this year – showing off new apparel, helmets, shoes and the production TTR1. We ended up stopping by their booth three of our four days at the show to get the full scoop on all of their new products (and still almost missed one!). Check out our galleries below and stay tuned for full reviews of Louis Garneau’s 2015 lineup! “Entry-level” and “TT helmet” are not words we’re used to putting together. In fact, entry-level may be the furthest thing from our mind when we think of a time trial helmet. 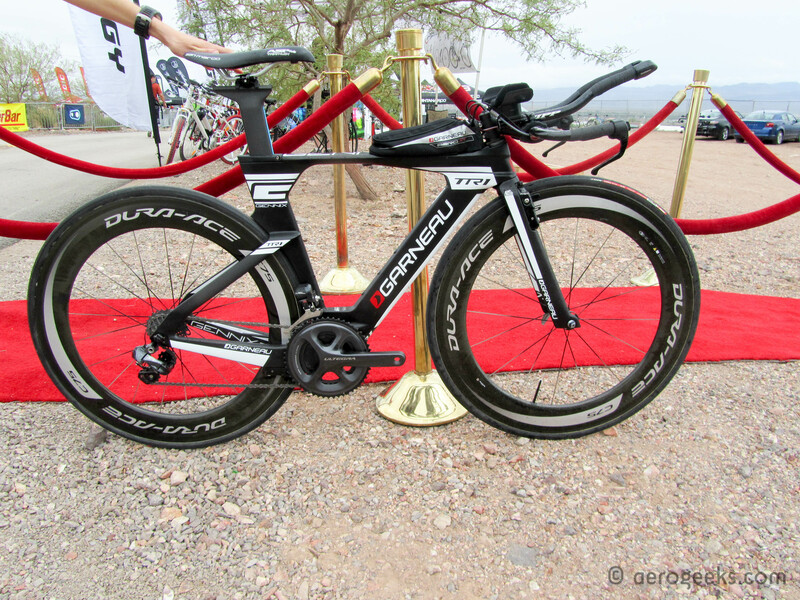 But Louis Garneau knows that most triathletes don’t have unlimited funds and set out to offer a solution for those looking to get more aero on a budget. The P-06 is that solution, and at $124.99 it won’t break the bank. While, LG doesn’t have data to share on the P-06 yet, they should in the coming months. The M2 tri suit blurs the line between a one- and two-piece tri-suit. While it may look like a two-piece suit at first glance (and really more like a standard cycling kit than tri suit), it is in fact a one-piece suit with a ¼ length sleeve, full zip top and bib bottoms that are connected at the back. By being a one piece suit (but the front being full zip and able to hang open), you are able to meet the WTC requirements of having a top on at all times while retaining the ability to fully ventilate your chest (something many athletes racing in warm climates will appreciate). LG was also showing off their new top-of-the-line triathlon shoes. The 400s feature a BOA lower enclosure and Velcro upper. The lower BOA is two-way adjustable, allowing you to make small adjustments to tighten and loosen the shoe (earlier versions of BOA only allowed the smaller adjustments when tightening). As would be expected from their highest end model, the sole is full carbon. We actually first saw the TR1 last year, but that was still a preproduction model. LG brought several production models this year, including a few painted in Team Merrell colors that looked simply fantastic (though we may be biased when you check out that color scheme!). The TR1 is built with age groupers in mind – specifically to have geometry that allows a standard age group athlete to stay aero for the entirety of the race. As part of the design process, LG consulted not only with pros and industry athletes but with age groupers as well. This is one of the reasons the TR1 is spec’d with a Zipp cockpit – it is one of the easiest cockpits to fit (a quality most age groupers and their LBS should really appreciate). Interestingly, LG performed all of their CFD analysis on the TR1 with standard round bottles, and actually designed it to be fastest with bottles on board. Through that analysis, LG claims the TR1 is most efficient at 12-18 degrees of yaw. This aero efficiency is achieved through a number of methods, including directing the air between the tri-specific fork (there is also a UCI-legal fork available) and wheel, and then around the frame. LG also pushed the front wheel forward to help stabilize the bike during straight line motion. The TR1 is also a bit of a lightweight. With Di2 and Shimano C75 wheels, it weighs in at just 17.5lbs. We plan on having one available for testing sometime in the spring (hopefully in Team Merrell colors), so stay tuned! Oops – that should be 17.5 pounds. Thanks for pointing that out to us.